Politicians don't give speeches like the one Barack Obama delivered this morning at the National Constitution Center in Philadelphia. Certainly presidential candidates facing the biggest crisis of their campaigns don't. At moments like these  when circumstances force them to confront and try to defuse a problem that threatens to undermine their campaigns  politicians routinely seek to clarify, diminish and then dispose of the problem. They play down the conflict, whatever it is, then attempt to cut themselves off from it and move on, hoping the media and electorate will do the same. What they don't do is give a speech analyzing the problem and telling Americans that it's actually more complicated than what they believed. They manifestly do not denounce the offensive comments that stirred up the trouble to begin with and then tell Americans to grow up and deal with the fact that those same remarks, however wrong and offensive, are an elemental part of who they are, and who we are. Obama did what politicians so rarely do  acknowledge complexity, insist that the issue currently roiling the presidential campaign  the story of Jeremiah Wright's words  is not a story that is clear-cut between right and wrong, or between black and white for that matter. Having waged a campaign, with great success, on the notion that race as a political and electoral issue could be transcended, with a strategy that assiduously downplayed race, Obama declared today that the only way to transcend race is to focus on it rather than downplay it  to acknowledge its sometimes oppressive presence in American life, in the form of both black anger and white alienation. To attempt to transcend race either by ignoring it or simply declaring it transcended would be folly  even now, in the year 2008. That was the reality Obama both confronted and embraced today. "Race is an issue that I believe this nation cannot afford to ignore right now," he said. "We would be making the same mistake that Reverend Wright made in his offending sermons about America  to simplify and stereotype and amplify the negative to the point that it distorts reality." Instead, he challenged Americans to learn something about their country, to seek to understand those whose emotions seem threatening, wrong-headed, even un-American. He asked whites to understand that the anger behind Rev. Wright's comments, while paralyzing, was also valid, the result of decades and centuries of real discrimination and oppression suffered by African Americans. And he asked blacks to understand that whites who resent affirmative action and whose fears of crime lead them to stereotype blacks should not be dismissed as racists, because their concerns and fears are real and valid, too. "This is where we are right now," Obama said. "It's a racial stalemate we've been stuck in for years. Contrary to the claims of some of my critics, black and white, I have never been so naïve as to believe that we can get beyond our racial divisions in a single election cycle, or with a single candidacy  particularly a candidacy as imperfect as my own. But I have asserted a firm conviction  a conviction rooted in my faith in God and my faith in the American people  that working together we can move beyond some of our old racial wounds, and that in fact we have no choice if we are to continue on the path of a more perfect union." 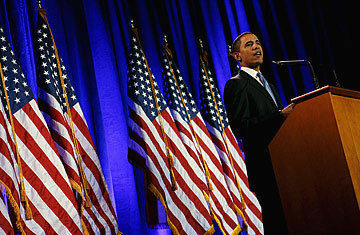 Obama's speech was profound, one of the most remarkable by a major public figure in decades. One question  perhaps the question is whether its sheer audacity makes for good political strategy. By confronting the Wright controversy head-on, Obama ensured that it would drive the narrative about his campaign, and his race against Hillary Clinton, for days and perhaps weeks to come. He and his advisers no doubt calculated that nothing they could do would change that fact. But if one of the appeals of Obama's candidacy has been the promise of a post-racial politics, how will voters respond to a speech acknowledging that the future is not now, that race still divides us? Obama is taking a substantial risk. He is counting on voters to hear and accept nuance in an arena that almost always seems to reward simplicity over complexity. He is asking something from Americans rather than just promising things to them  another formulation long out of vogue. "For we have a choice in this country," he said. "We can accept a politics that breeds division, and conflict, and cynicism. We can tackle race only as spectacle  as we did in the O.J. trial  or in the wake of tragedy, as we did in the aftermath of Katrina, or as fodder for the nightly news ... We can do that," he goes on to say. "But if we do, I can tell you that in the next election, we'll be talking about some other distraction ... And nothing will change. That is one option. Or, at this moment, in this election, we can come together and say, 'Not this time.'" Usually when politicians pose those kinds of either/or options to an audience, the choice is deliberately devoid of real tension. Either we move forward or fall backward, either we let the economy falter or we help it grow, either we succumb to our enemies or we defeat them  the choice is up to you, America! Obama's either/or formulation is not nearly so banal. Explicitly asking Americans to grapple with racial divisions, and then transcend them  that's a bold request. Will they comply? Obama's presidential hopes depend on it.